Master bedroom. King Size bed. Private balcony. Fall alseep to the sound of the ocean. 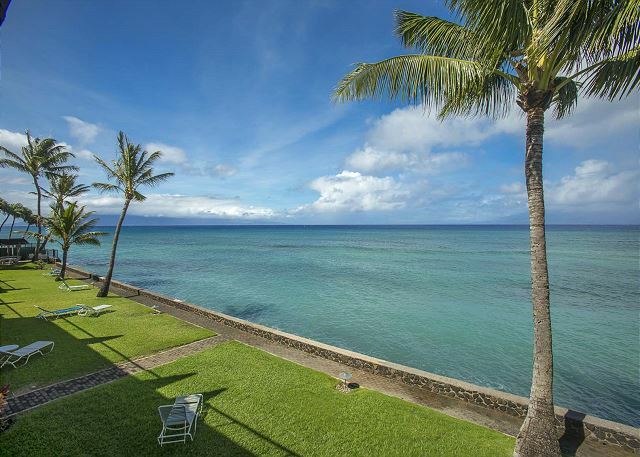 B202 is a 1,117 square foot, two story ocean front townhome with a westerly view framed by the islands of Molokai and Lanai. 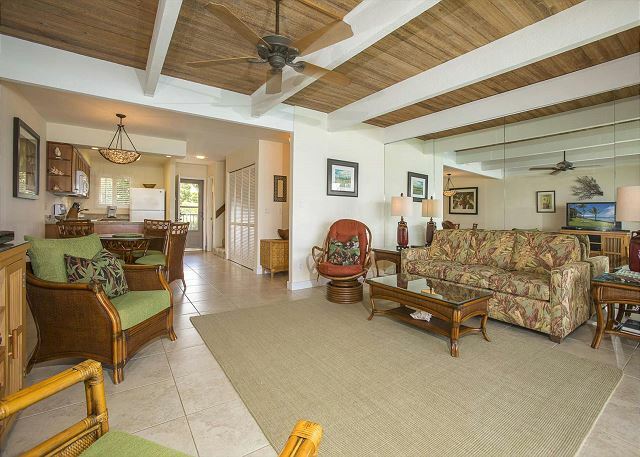 B202 is set back from the road with direct ocean views where you can enjoy the sounds of the ocean surf, swaying palm trees and spectacular sunsets from the two lanais off both the living room and master bedroom. B202 is a fully equipped apartment with air-conditioning in both bedrooms and the entire first floor. 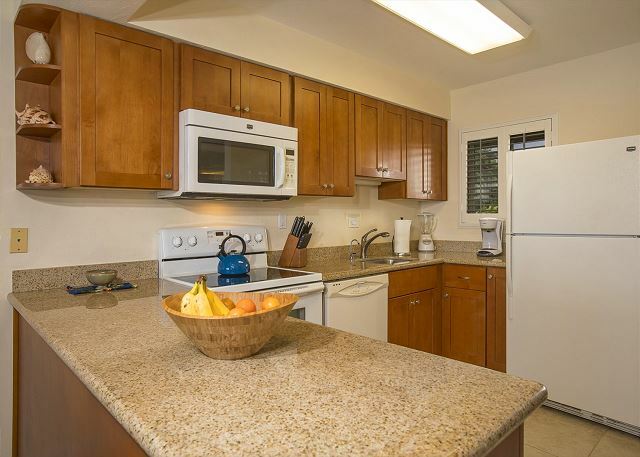 Amenities include a well-stocked kitchen with granite counter tops, two recently remodeled bathrooms, new washer dryers, tasteful Hawaiian style furniture and flat screen TV’s with HD cable programming. Bedrooms are upstairs offering lots of privacy. As of October 2017, this unit has had the air-conditioning upgraded, new low-e sliding glass doors with screens and fresh paint in all rooms. We had an amazing stay at Lokelani. The staff was super friendly and accommodating. Will definitely go back! Mahalo for staying with us. We look forward to your return. Had a short 3 day stay at this great location. Very close to the water. Loved watching the waves crash against the rock wall. Great sunsets. Swimming beach is next to the property on the right. Was able to snorkle there. 5 and 7 yo loved swimming in the pool. Had good air conditioning in each room when it got hot during the day. Nice fans in each room. Kitchen well stocked with cups and utensils. Great water pressure throughout. Spacious 2 level condo. 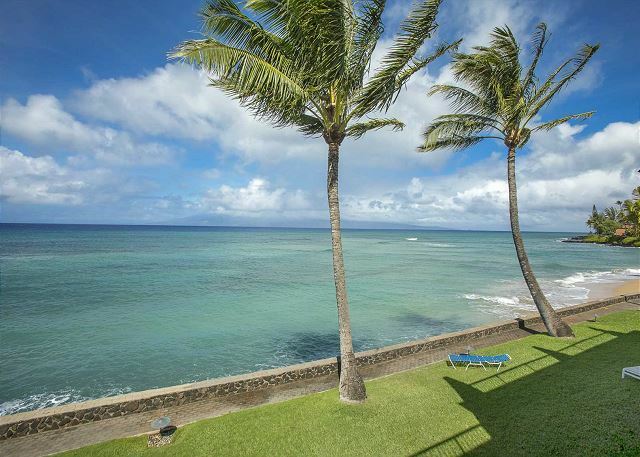 Great views from 3rd floor master bedroom deck and 2nd floor main level lanai. Great to have washer and dryer. Beautiful birds of paradise and flowers on the grounds. Beautiful place, very friendly staff and other vacationers. Beachfront with great snorkeling and lots of turtles. Our favorite spot to stay!! Our4th time at this location. As usual all the amenities were there and well maintained. Received good friendly service from staff and would recommend it to others. Family friendly. A bit of a drive from the airport but well worth it. Will try and go next year. Easy relaxed atmosphere and other guests friendly. rooms were right on the water which was real nice. Always a great to stay at Lokilani. Liz is wonderful and helped us out at every opportunity. The condo was very nice and we left some comments since the owners are just beginning to lease this unit out. Really nice location. Unbelievable oceanview from the unit. Thank you very much for staying with us. We hope to see you again. Had been to Maui several times prior to finding this place in 2015. We have no desire to stay anywhere else on the island. The view is AMAZING, great snorkeling and private beach. Our 5 year old was so excited to swim in the ocean with the turtles and was able to do so every day. This is our forever Maui place now. Aloha and thank you for staying with us. We cant wait to have you back! My family and I had the opportunity to spend ten days at Lokelani Condos. It is truly a little slice of paradise. The first morning there, we had a beautiful rainbow over the water. The view is lovely and the beach, I think, is the best beach on Maui. Everyday, we had green sea turtles in the water right in front of the condo. They were on the beach and would swim by you while you were in the water. The condo was great. It was very well equipped and very clean. The grounds are great and someone was out everyday making sure the grounds were well taken care of. We couldn't figure out how the disposal worked and someone promptly came and reset it. A light blew out and, again, someone came right away to take care of it. Another thing, is that the condo complex supplies paper products, laundry detergent, dish soap and dishwasher soap. When we ran out, we went to the office and got what we needed. This savings adds up. I can't say enough about what a great place Lokelani is. 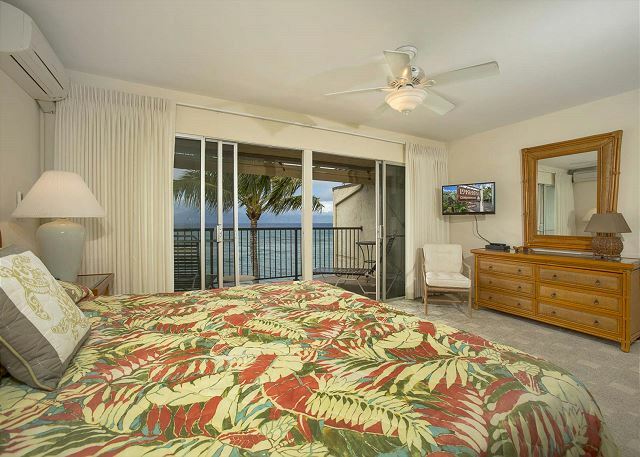 If you are thinking about a Maui vacation, love the beach and looking for a great place to stay, checkout Lokelani! It's the best! The view from this condo is second-to-none! We watched whales jump right from the balcony and never felt we were missing "beach time" by enjoying our morning coffee. The office staff was very nice on checkout. We were surprised to see the office closes at 3:30 so if you check in late, be aware you cannot get beach chairs, etc. after that time. 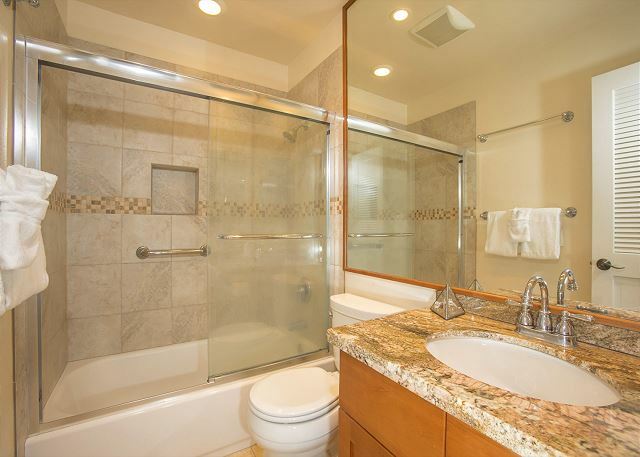 The condo was fairly clean, although the showers could use a go with some bleach to tackle a little mildew. Our biggest concern was the furniture and layout - the beds were rock-hard as was the couch so there was no place to sleep comfortably. 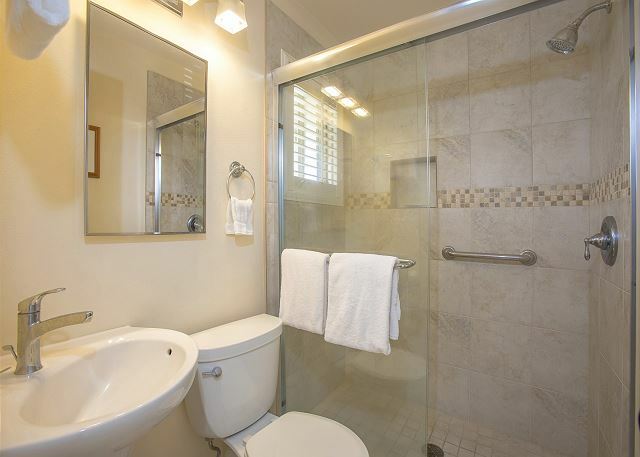 Also, one of the full baths is directly inside the front door by the kitchen so absolutely NO privacy for one couple. The bedroom and bathroom doors are louvered so there's little privacy with doors closed either - you can hear every bathroom and bedroom noise. However, the location was wonderful and the rear grounds (beachside) were immaculate. Well my vacation was fine. The linens were very thin and no extra sheets to wash and change linen. The condo was well equipped. I can't get your survey stars to work. The whole condo property is getting to look very old and and not freshened. We had a great stay at Lokelani and we intend to spend the same amount of time next year. 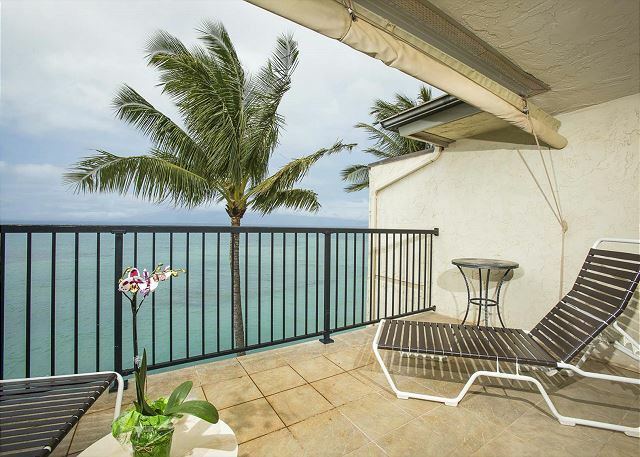 We love the view from our lanai. We were able to watch turtles and whales right from the lanai. We rented away from the beach and the pool so it was quiet. Also, the tenants tend to be older so the property is generally quiet which suits us. Snorkeling with fish and turtles was possible right from the small beach. Lokelani was more than we expected! The Oceanview when we walked in to our 2 bedroom condo was amazing and the oceanview from our master bdrm was just as fabulous. Everyday we woke up and looked @ the ocean w/out even leaving our bed. The condo was spacious, well stocked and clean. If anything was lacking Liz was always on top of it to accommodate us. The beach access was better than any resort w/out the crowds. Snorkeling was good and we saw turtles in the water & on the beach on a daily basis. Location was great! We will stay here again on our return trip to Maui!! Excellent. Clean unit, quiet building, all you hear is the ocean waves. 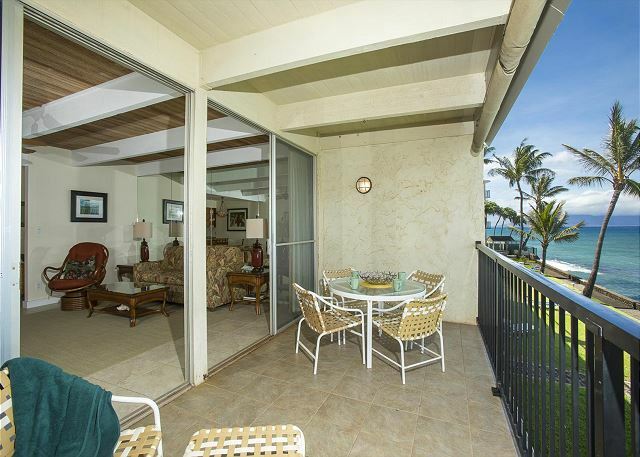 Direct oceanfront, as in 30 feet from the lanai. The BBQs are maybe 15 feet from the ocean...This was my third time back here. 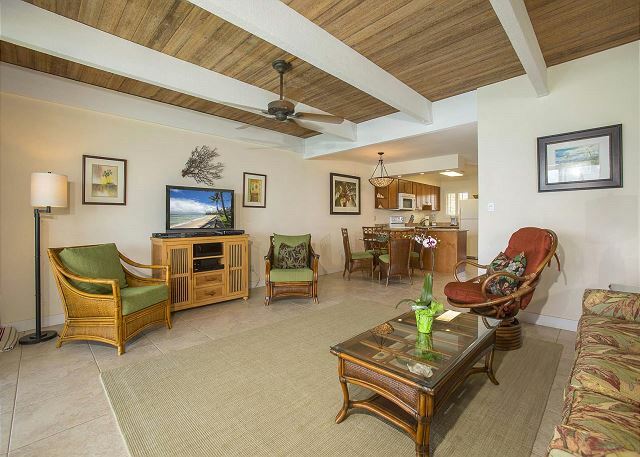 This was our first time in Maui and found this condo to be located in a perfect home base from which to explore the island. Away from the big resorts but near everything we needed. Watching the turtles on the sand and water right below our deck was a real treat. Liz was great and left a little gift basket for us with maps and coupons. Condo was very clean and well stocked. Would definitely stay here again?? Great time vacationing at Lokelani condos. This was our second stay at Lokelani. Once again we really enjoyed a relaxing stay. The condo was very comfortable. We spent much of our time watching the turtles and ocean from the two balconies and enjoying the beach right outside the condo. The rainbows are incredible! We were thankfuly for the air conditioning in the bedrooms at night. There are several small local restaurants within walking dstance and a grocery store too. I loved the condo. the view was so great plus seeing the turtles come up on the beach really were fun to watch.Having a parking place near the room made it really handy. I would recommend this location to friends. We also enjoyed the pool. It was not crowded. the lady at he front desk was very friendly and helpful. JAMES V from CHESTERFIELD, MISSOURI does not recommend this vacation rental. The unit was average a far as furnishings, but very adequate. Needed updating. Could have been cleaner, but not dirty. When contacting Lokelani the office seemed very professional and helpful. They contacted us prior to our departure with specific information, i.e., parking space, how to get into unit if they were not there, etc. Our biggest complaint was the office is open Mon-Fri, from about 9:00-3:00, if you're lucky. Whenever we went to office to ask about something, they were either closing, on the phone, etc. Kind of got the impression they didn't want to be bothered. Previously, I had been a guest of friends staying at Lokelani; so when I was planning a return trip to Maui I immediately thought of Lokelani. My brother and I took one of the larger 2-BR (B-202) units. It was well-appointed and tastefully decorated. The only comment I would make is the absence of cordless phones on both floors proved to be a problem for me. This was important to me because I have limited mobility and trying to get to the phone on the first floor proved to be a problem. We have stayed at Lokelani on several occasions and have found it to be the perfect place for us. It is so relaxing to be able to watch both whales and surfers from your lanai. We look forward to the next visit with anticipation. Justin M from Veradale, WA does not recommend this vacation rental. We've stayed at Lokolani before and had no complaints, actually fell in love with it, but this trip there were several things that would make me consider staying somewhere else next time. 1. The biggest thing that bothered me - The room was equiped with things people before us bought and left. For instance there were boogie boards for the water, snorkel gear including flippers, beach towels, sunscreens. Some other none water stuff, like coffee's and tea's. But this time there was very little. We love to snorkel but are amateurs so we use a board to hold onto. When I asked the office if they had any boards they said no they weren't allowed to keep them anymore. We later saw several in the trash bins they had thrown away. We ended up having to rent the boards for the 8 days we were there. We had already bought sunscreen but lost it and had to buy another. My wife says they took the warm home-ness out and turned it into a normal boring motel. 2. We brought our own movies to watch downstairs with the other couple that went with us. But the night we reserved for movies we couldn't get the DVR to work. We aren't new at this, it was the DVR. 3. The night we reserved to cook Ribs outside only one of the grills worked 100%. The one furthest away from the corner we wanted to fish/cook at. After paying $80 for all the fishing gear the plan of fishing and cooking was pretty much ruined too. There was also fishing stuff left in the condo's on all trips before this one. It just feels like this turned into, make the tourists buy everything and spend as much money as possible. Not like we already have spent enough on the trip paying over $200 a night for the condo. We knew the trip would be expensive but it reminds me of Vegas now, every time we turn around it's another expense. The old way of managing the condo's will be missed and to be honest I doubt we will stay here again. Excellent! Good location, quiet, had everything that we needed. Beach is a bit limited but ok. Easy check in/check out, very clean. Central air cond. would be great as it was extremely humid and damp...things didn't dry. We had an awesome time as we usually do staying at Lokelani. All of the staff and maintenance people are wonderful and friendly.The condo was clean and everything we needed was there. Lokelani's management has always been very accommodating to our needs. That's why we come there twice a year and will continue to so. We had an amazing vacation. We were welcomed by sea turtles sun bathing on the beach. We were very happy with the condo and look forward to returning. Clean and comfortable with beautiful ocean view. The beach was perfect for snorkeling. We swam with turtles and enjoyed the beach daily. Six wonderful days in Maui at the Lokelani … paradise! The location is beautiful and the condo is equipped with any amenity you might need, including a washer and dryer and dishwasher (nice for 6 people!). We enjoyed watching the sea turtles from our lanai and falling asleep to the sound of the waves. A truly enjoyable family vacation! A few minor mentions: the mattress on the pull out couch desperately needs to be replaced. We all laughingly called it "the rack". Also, because of the weather (unusual storms, lots of wind…), the beach was not accessible from the property; the sand that usually creates the access had washed away. Minor things really. Awesome location and wonderful staff made up for the minor inconveniences. We've been lucky enough to stay on Maui's west side several times. The Lokelani visit was our 1st and presented a couple of strong pluses. The units are set back from the main road enough to mitigate traffic noise. 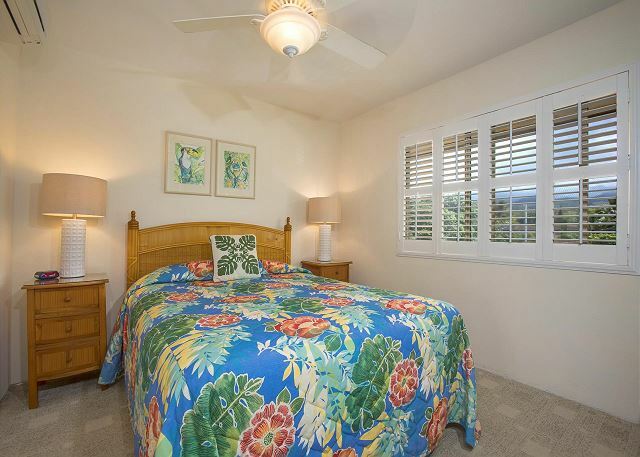 Each bedroom also had air conditioning units which offset unusually high temperatures during our stay.The location puts you right between Lahaina and Kapalua which gives you all sorts of options. The only negative I can relate is the consistency of the outdoor grills which could all probably use a thorough going through. Honestly, though,it was a minor concern. The biggest complement we could pay to the Lokelani is the fact that we all would comeback in a heartbeat. Loved staying in this part of Maui (been to Maui several times, this was our favorite location). Every amenity possible was included. Towels were very plush, both bath and pool. Two lanais was awesome! Very private, both the complex and each individual unit. Could not have been more happy. The view is amazing. Condo has everything you need. The two bedrooms with air helps sleeping at night and a place to cool off. We love the private beach and no crowds. From my initial contact to the last day of our stay, everything went smoothly and was exactly as described. Kim is a dream to work with. The rainbows, turtles and island views from our balconies made each day special. Lokelani is off the beaten path, intimate and yet convenient to everything. Everyone was very friendly. We hope to come back Some day. Thanks for everything, Kim. Great experience from start to finish! Can't wait to come back! Second visit to Maui, first time at this condo and we just loved it! 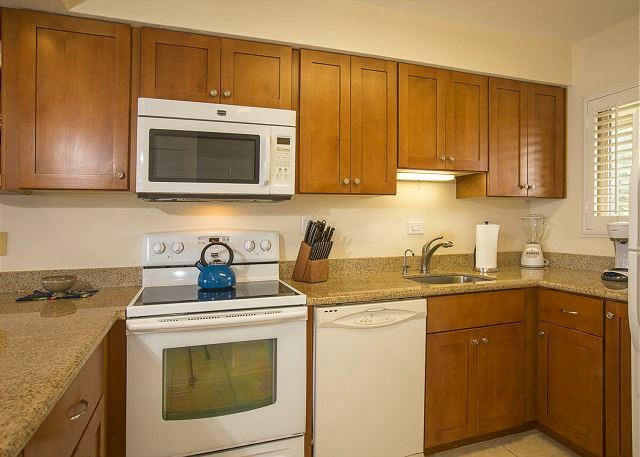 Very spacious, clean, great location, great service with the gals in the office, neverending ocean views, sea turtles everyday, rainbows on the mountain side, great kitchen with icemaker, and on and on. Really a great place! Wish I could come back now. Until then I will enjoy the memories and all my pictures. Thank you!! Like Turtles? They're out your back door!! Great place to relax with beautiful views and without all the crowds. a guest from Anchorage, Alaska does not recommend this vacation rental. Was an absolute wonderful experience. Beach was great and the units we stayed in were beautiful. IT was a great time and the condo was very nice. The only recommendation would be to have instructions in the binder for how to use the TV and the stereo. 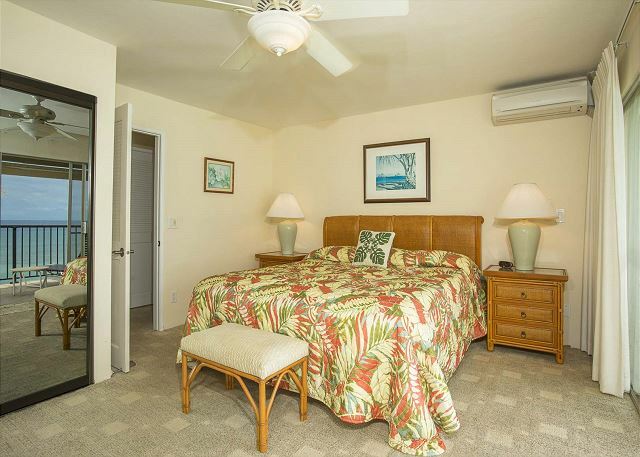 Great location in Honokawai close to major resort areas and with nearby shopping, beach rental and food. Condos are ocean front and very nicely appointed. We stayed in C206 recently remodeled and gorgeous. Reasonable prices highly recommend. Apartment B202 was a a welcome haven, as Hurricane Isselle loomed (though never quite materialised). The property is obviously very well maintained and equipped for whatever needs guests could conceivably have. 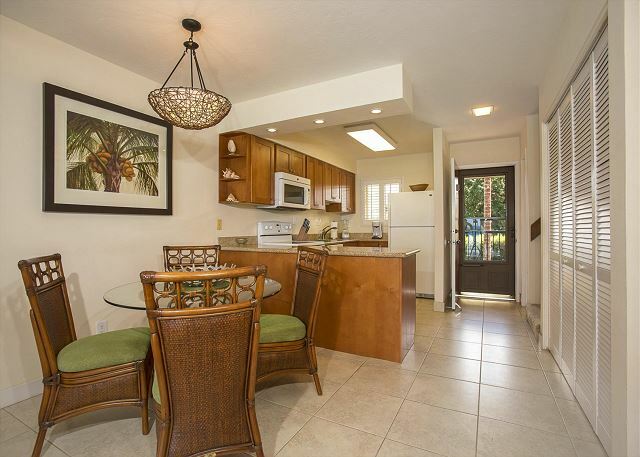 The location is good, in close proximity by car and on foot to lots of beaches. 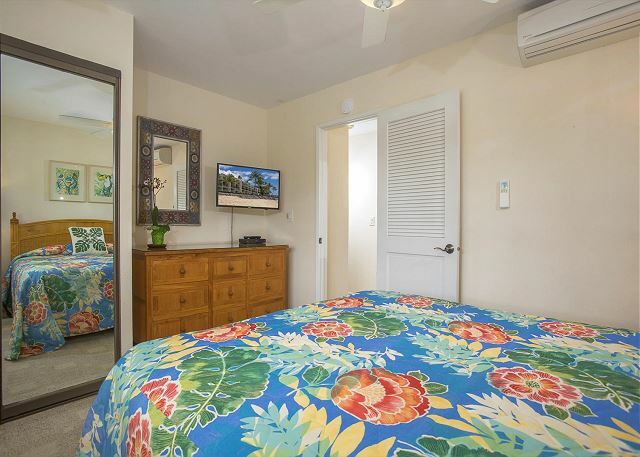 You can walk to a few local eateries, and easy access to shops plus a well equipped kitchen allows you to offset the occasionally eye watering cost of holidaying in Maui. 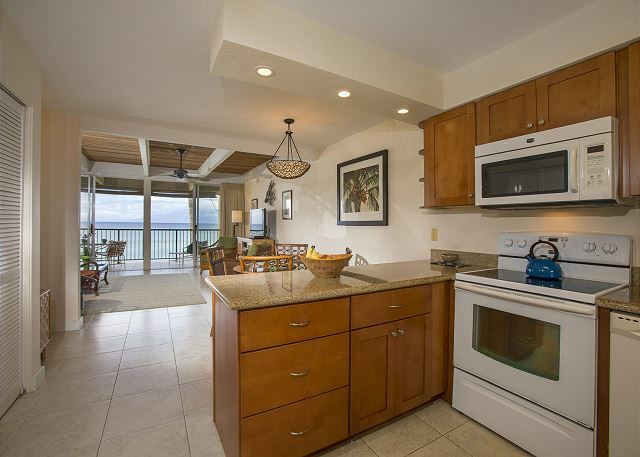 As other reviews will doubtless have noted, unobstructed views of the Pacific from lanais on each of the floors are really the standout feature of this apartment. We slept nightly with the lanai doors open - even as the short lived tropical storm threatened. Waking to the sound of the ocean is what I'll really remember about this lovely apartment. We loved the Lokelani! We were there this time as a family and having the kitchen with all the pots and utensils you could need was a big money saver! The property is very clean and we'll cared for, the staff was wonderful. The view and access to the water could not be better! We saw soooooo many turtles and beautiful rainbows everyday. We enjoyed laying on the beach, snorkeling and playing in the water just steps from our room. It doesn't get much better than that! Just a short drive north is The Sea House Restaurant; the food, service and atmosphere/view are amazing and worth the visit. Another wonderful experience in Maui. We will be back to the Lokelani again and definitely recommend it!